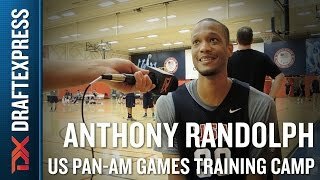 A video interview with NBA forward Anthony Randolph at the USA Basketball training camp for the Pan-American Games. DraftExpress: Do you ultimately see yourself as a small forward or a power forward? Anthony Randolph: It depends on what team I go to. If Im needed at either one of those positions, I just want to be prepared for either one. Although he continues to largely slip underneath the radar screen as far as national attention goes, few freshman have shown more glimpses of potential than LSU power forward Anthony Randolph. Randolph fits the bill and then some. He does have an extremely lanky frame, though (think Brandan Wright), one that might struggle to put on significant weight even down the road. Skinny or not, Randolph wows you at times with the versatility he displays offensively. Hes a very good ball-handler for his size, able to grab a rebound and take the ball all the way down the floor (weaving through traffic impressively) and finish the play himself, or even create shots for himself in the half-court. His first step is excellent, and he has some basic jab-steps or wiggle moves that keeps his matchup guessing constantly as to what his next move will be. Although hes left-handed, he seems to be just as dangerous going right, which is quite intriguing considering his size, youth, and the fact that hes seemingly living purely off his instincts at this point. This ability to face up and attack his man off the dribble makes him a huge mismatch threat at the next level, especially as he continues to polish up his ball-skills, learns how to minimize his turnovers, and becomes a better finisher around the basket. He also has some basic (mostly finesse) moves he can execute with his back to the basket, but his lack of strength hinders him from being as much of a presence here as he could. Randolphs jump-shot needs lots of work, even if there are definitely some things to work with as hell show from time to time by knocking down a smooth mid-range jumper, sometimes coming off a pick and pop play. His mechanics are strange, though, like many left-handed shooters (especially from 3-point range), releasing the ball while almost standing sideways, not quite squaring his shoulders or elevating off the floor, and getting extremely poor resultsjust 2/16 from behind the arc on the year. That wouldnt be so bad if Randolph didnt have as much of a tendency as he does to settle for bad shots and force out of control drives. His whole team seems to play incredibly selfish basketball, and Randolph is at times just as much a culprit as his shot-happy guards. He doesnt seem to quite know his limitations at this point, settling for weak, off-balance, turn-around jumpers from mid-range, fading away from contact in the post, and generally showing poor shot-selection and a limited feel for the game. Its not hard to tell that Randolph still has plenty of room to improve with everything that has to do with his fundamentals. Where Randolph seems to need the most work, especially when considering how hell have to be used at the next level, in his defense. He gets pushed around in the post mercilessly; being unable to hold his spot on the block, and thus letting most big men just have their way with him as they please. The problem here is that Randolph doesnt seem to put up much resistance, giving up too much space in the post, not showing a great deal of fire fighting back against stronger players, and displaying a laid-back demeanor that is somewhat concerning at times. He gambles for steals, shows poor awareness on the perimeter, and isnt always quite as active as you might hope. He clearly has the quickness and length to hedge screens and stay in front of his man, as well as the instincts to get after the ball and make his presence felt, but he doesnt seem to quite know how at this point. With that said, its hard not to be impressed by the physical tools, reactivity and nose for the ball he shows coming up with blocks, getting in the passing lanes, grabbing offensive rebounds and moreyoud just like to see it happen more often. There seems to have been some improvement in his effort (particularly as a rebounder) since LSU switched coaches a few weeks ago, so well have to see how this continues in the near future. All in all, Randolph might be viewed as one of the more intriguing long-term prospects in this draft once you get past the top 5-6 names on most teams boards. Hell probably be viewed as the type of hybrid face the basket 4/3 that is becoming very much en vogue in the NBA these days (see: Shawn Marion, Travis Outlaw, Tyrus Thomas, etc) as a mismatch threat playing on a very up-tempo team. There are still a lot of kinks he needs to work out in his game before he gets there--both physically and mentally--but considering the fact that he wont turn 19 until July, time is obviously on his side. From what weve been hearing for quite some time, there is a very good chance that hell be in the draft. LSUs Anthony Randolph entered the season as one of the more talented freshman that nobody in the national media cared to know about. A consensus top 20 player by every major recruiting service, he failed to get the national acclaim of many of his more heralded counterparts. Randolph has failed to disappoint thus far at LSU, putting up an impressive stat line and displaying intriguing long term potential. The 611 forward possesses a package of skills rare for a player his size, able to take defenders off of the dribble equally as well as he is able to score on you with his back to the basket. He owns a very consistent jumper from midrange and is even able to step out to the three point line, although his accuracy drops a bit when venturing out that far. The Dallas native shows off a great handle for a player his size, able to easily beat big men off of the dribble, while also capable of bringing the ball up the floor when need be. The perimeter skills that he owns are certainly interesting, in particular for teams in need of a face the basket power forward. Athletically, there is no tag more fitting then freak. A long wingspan, explosive leaping ability, and very good quickness are all possessions of Mr. Randolph. He is one of the more explosive leapers that the collegiate game has to offer, getting his head near rim level multiple times in the games we observed this season. Able to run the floor with the speed of a player much smaller then him, he is often able to beat the opposition down the court for explosive dunks in transition. While all of the raw tools and skills are there for an elite prospect, Anthony certainly has some room for polish. His handle needs to be tightened up if he hopes to play on the perimeter at the next level, while his post moves could use refinement as well. The LSU frosh really only goes to a turnaround jumper out of the post and will need to further develop his talents in the pivot if he hopes to maximize his potential. The other area that Randolph must certainly improve upon is his strength. While he has bulked up to 220 pounds, he is still very weak and is pushed around down in the paint. His lack of strength limits his ability to finish around the rim at times, especially when absorbing contact. Anthonys insufficient girth hurts him on the defensive end likewise, where he tends to be outmuscle at times by stronger big men. Randolph is a very good defender at the moment, with the potential to be an outstanding one down the line with improved strength and maturity. A good positional defender, he is able to get in the proper place to alter shots and rebound the ball at a high clip due to his freakish length and leaping ability. With the athleticism that he boasts, Anthony also has no trouble defending on the perimeter, able to stay in front of opposing players four to five inches inferior to him on a regular clip. He uses his length and speed to get out in the passing lanes exceptionally well for a player approaching the seven foot mark, getting a steal and a half per game and many more deflections. The only real problem that Randolph has on the defensive end is his lack of strength, leaving himself able to get pushed around at times in the pivot by bulkier post players. If he is able to get stronger over the next few years, the possibility is easily there for the McDonalds All American snub to develop into a special player on the defensive end. The NBA is certainly going to be an option for Randolph after this season, granted he would be better suited to stick around for his sophomore year to develop physically. It is rare that you see a player with the package of size, skills, and athleticism that he brings to the table. Despite the fact that Anthony does not receive the notoriety of some of the other freshman prospects, he is easily amongst the elite as far as NBA potential is concerned and is a player definitely worth checking out given the opportunity. In terms of raw talent and potential, there are few who offer more then the 610 forward from Texas. He was easily the most athletic player in the game, utilizing his jet like end-to-end speed and freakish leaping ability to change the game on the defensive end. Randolph had numerous dunks that just left observers shaking their heads in disbelief, and boasted his blinding first step when taking opposing power forwards off of the dribble. Although he did not connect from a bomb from three point land, he did make numerous 18 foot jumpers and showed that he is far more comfy facing the basket then he is down on the low blocks. Anthonys biggest weakness is by far his strength, or lack thereof. He is incredibly frail down low, often crumbling to the ground once he absorbs contact. He owns upside that no more then six or seven player of the class of 2007 offer, and with some refinement and strength development at LSU, could easily be a lottery pick before it is all said and done. DraftExpress: Tell me a little bit about what happened with the McDonalds game? Did you get any explanation as to why you were snubbed, given that virtually everyone has you as a top 15 guy in the country? Randolph: I dont think I was snubbed. They put the best players in the game. Im just grateful that I was chosen for the Roundball Classic and the Derby Classic, and thats what Im supposed to play in. Everything happens for a reason. I wasnt supposed to be in that game. DraftExpress: Tell me a little bit about how your high school season went. Randolph: We did kind of bad. We didnt make the playoffs. I dont think it was issue of talent, but it was an issue of us gelling and stuff. DraftExpress: With Glen Davis entering the NBA Draft, have the coaches at LSU spoken with you about how your role might have to change a little? Randolph: Not really. Its the same thing that they talked to me about. They just want me to come in as a basketball player and want me to get better as both a basketball player and a person. DraftExpress: Now have they told you what position youre going to play next year? Randolph: No, not really. They just said that Im going to come in and play basketball and theyre going to make me a basketball player. Thats all I can ask for. DraftExpress: What areas of your game do you feel you need to improve upon the most? Randolph: My consistency. Sometimes I can hit shots when Im hot, and others its just a little off. Other then that, its just my size and understanding of the game. DraftExpress: With the AAU camp scene changing and there only being the Nike camp until Reebok recently announced that they were holding their own camp, do you prefer it with only two camps, or with all three major camps? Randolph: I like it with all three camps because I feel its more competitive. When you have only two camps, youre focusing on a much smaller amount of people and theres not going to be as much focus of helping as many players get better. DraftExpress: What is the pressure like from the three different shoe companies to play in their respective camps and all-star games? Randolph: Really there is no pressure. I just play basketball to have fun. Thats what Im going to do. DraftExpress: So how did you decide which camps and all-star games to play in personally? Randolph: Well I knew I was going to play in the Adidas game because thats who I was with. I knew if I was selected for the Roundball Classic, I was going to play in this game because there is such a historic atmosphere. So many great players have played in it and it would have been a great honor just to be selected, so I knew I would come play here if I was selected. Randolph: Honestly, at first I didnt like it because I was one of the kids who thought I had a chance to go (to the NBA). Now I realize that I have a lot of work to do and its going to get me better by going to college. I will have that college experience. College will allow me to put on weight and it will make me better as a person. DraftExpress: If there is no age limit, what are you doing? College or the NBA? Randolph: Now, I would go to college. Before if all of this wouldnt have happened, I would have tried to go (to the NBA). DraftExpress: Who is your pick for the Ohio State/Florida game? Randolph: Florida. Theyve got everybody coming back. Thats just experience. Ohio State is pretty good, but I think it would be an upset if Ohio State won. DraftExpress: When selecting a college, were you looking for a school that would give you the opportunity to be one and done after your freshman year?